Take all the clichés used to describe a long overdue event or the unexpected fulfillment of a promise (hot places freezing, heavy animals soaring through the air, etc...) and you still couldn't say enough to fully proclaim the news that ATI has finally properly hard launched a product. That's right, looking around the internet this morning has provided us with the joyous realization that the Radeon X1900XT, XTX, and CrossFire parts are available for purchase. We've tried to keep an eye on the situation and it's been quite easy to see that ATI would be able to pull it off this time. Some sites started taking preorders earlier in the week saying their X1900 parts would ship in one to two days, putting the timeframe right on the mark. There were no missing dongles, no problems with customs, and ATI told us last week that thousands of parts had already been delivered to manufacturers. And if that isn't enough to dance about, ATI has delivered a hugely powerful part with this launch. The Radeon X1900 series is no joke, and every card featuring the name is a behemoth. With triple the pixel shader units of the X1800 XT, and a general increase in supporting hardware throughout the pixel processing engine, ATI's hugely clocked 384 Million transistor GPU is capable of crunching enormous volumes of data very quickly. Fill rate isn't increased very much because the X1900 series still only allows 16 pixels to be drawn to the screen per clock cycle, but power is delivered where it is needed most. With longer and more complex shader programs, pixels need to stay in the shader engine longer which further shifts the performance burden from the theoretical maximum fill rate. NVIDIA would like us to compare the X1900's increase in ALU (arithmetic logic unit) power to what they did with the FX 5900 after NV30 tanked. Certainly, increasing the math power (and increasing memory bandwidth) helped NVIDIA, but fortunately for ATI the X1900 is not derived from a fundamentally flawed GPU design. The X1800 series are certainly not bad parts, even if they are being completely replaced by the X1900 in ATI's lineup. I'll spoil the results and make it clear that the X1900XT and XTX are hands down the best cards out there right now. But all positives aside, ATI needed this card to hard launch with good availability, perform better than anything else, and look good doing it. There have been too many speed bumps in ATI's way for there to be any room for a slip up on this launch, and it looks like they've pulled it off. The launch of the X1900 series not only puts ATI back on top, but (much more importantly) it puts them back in the game. Let's hope that both ATI and NVIDIA can keep up the good fight. But let's not forget why we're here. The first thing we are going to do is talk about what makes the R580 GPU that powers the X1900 series so incredibly good at what it does. Good for ATI, after some issues in the not so distant past it looks like the pendulum has swung back in their direction. how would validating die-space on a gpu for cheats make any sense? If there is any cheat it's in the drivers. And no, the only thing is that 3dmark06 needs 24bit DST's for its shadowing and that wasn't supported in the x1800xt (uses some hack instead) and it is supported now. Is that cheating? The x1600 and x1300 have support for this as well btw, and they came out at the same time as the x1800. 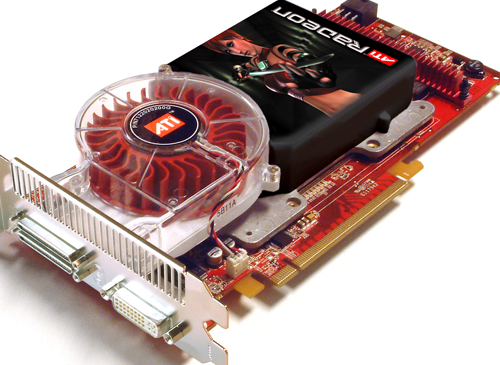 "Notoriously demanding on GPUs, F.E.A.R. has the ability to put a very high strain on graphics hardware, and is therefore another great benchmark for these ultra high-end cards. The graphical quality of this game is high, and it's highly enjoyable to watch these cards tackle the F.E.A.R demo." Wouldn't the majority of people with displays in this range have 1920x1200 since that's what all the new LCDs are using? And it's the HD standard. Aren't LCDs getting to be pretty capable game displays? My 24" Acer has a 6 ms (claimed) gray to gray response time, and can at least hold it's own.